Welcome to Rekindling the Reformation! We seek to revive the spirit of the Reformation and to keep the memory alive of those that fought for our freedom and what they stood for. If we do not learn from history, we are doomed to repeat it. The stealthy efforts of a Counter Reformation have been craftily and carefully implemented behind the scenes of society until the noble effects of the Reformation have almost been annulled. Join us as we rekindle the Reformation. The Protestant Reformation is usually dated from October 31, 1517, when Martin Luther nailed his 95 Theses to the door of the Wittenberg Church. The Theses were arguments mostly against the sale of indulgences by the Catholic Church which promised the buyer or even a loved one in Purgatory freedom from all penalties for their sins. The Theses challenged papal representatives to a public debate over those points listed. At the time of the Reformation, there was only one official Christian Church, the Catholic, or universal, Church. From the start, the reformers had no intention of breaking away from the Church or of starting new denominations. Under the influence of the Holy Spirit, they simply could not keep silent about the corruption in the Church. Had the Papacy at that time accepted the rebuke and made a thorough work of reform, the universal Church would even now be one. Instead, cries for reform were met with obstinacy and force. The reformers were left with no choice but to abandon a Church which had no resemblance to the original which Christ Himself had established. How did the Church become so corrupt? Based largely on The History of the Reformation of the Sixteenth Century, by J. H. Merle D’Aubigne, this article gives a brief overview of the conditions that prevailed in the Church at the time of the start of the Reformation. In many ways, Jesus Himself set a pattern for the Reformation. When Jesus began His ministry amongst the Jews, He came head-to-head against a priesthood that had carried too far their prerogatives as mediators between God and man. Jesus criticized them for piling up rules and regulations that hindered the people from knowing God for themselves. He said, “But in vain they do worship me, teaching for doctrines the commandments of men” (Matthew 15:9). The people had come to honor the priest, whom they could see, more than God, whom they could not see. The priests had made life miserable by laying upon the people religious burdens that were impossible to carry, while exempting the priesthood from those same requirements. Jesus said, “Woe unto you also, ye lawyers! for ye lade men with burdens grievous to be borne, and ye yourselves touch not the burdens with one of your fingers” (Luke 11:46). By their added requirements for acceptance by God, the priests had taught the people that God was hard to please and that the people had to work through a meticulous set of requirements to earn salvation. The Jews were told that in order to please God, they must please the priests—their earthly masters—first. Jesus came to remove these self-made masters and restore a right relationship between God and man, through faith, not faithless works. He said, “one is your Master, even Christ; and all ye are brethren” (Matthew 23:8). At the moment of His death on the cross, the temple curtain hiding the Most Holy place from view was torn by an unseen hand from top to bottom. This signified that the people now had direct access to God through His Son Jesus Christ and no longer needed a priestly mediator. Hence the apostle Peter could preach that all believers were “a royal priesthood” (1 Peter 2:9). Jesus removed the sacrificial system with its priesthood and Himself became the Mediator between God and man. For he is our peace, who hath made both one, and hath broken down the middle wall of partition between us (Ephesians 2:14). This freedom of access to the throne room of God was not for the Jews only. When Jesus returned to heaven, He gave His disciples a commission. “Go ye therefore,” Jesus said, “and teach all nations, baptizing them in the name of the Father, and of the Son, and of the Holy Ghost: Teaching them to observe all things whatsoever I have commanded you: and, lo, I am with you always, even unto the end of the world” (Matthew 28: 19-20). As a result of this commission, the apostles, or sent ones, carried the good news of salvation by faith in Jesus Christ to pagan lands. Until that time, pagan priests were as gods to the people of non-Jewish lands. The preaching of Jesus Christ and salvation by faith in Him dethroned these living idols who controlled the people by fear of punishment from the gods and offered salvation at a price. The Gospel instructed them that salvation was a gift from their loving heavenly Father which could not be earned by good works. The apostles taught, “For by grace are ye saved through faith; and that not of yourselves: it is the gift of God” (Ephesians 2:8). The proclamation of the Gospel meant freedom from fear and slavish service to the gods and their fickle, demanding priests. For a time, Christian converts enjoyed a first-love experience with God through Christ. But Christianity’s luster soon faded. The Church became worldly and its shepherds became corrupt. Christ had brought the good news of salvation as a free gift from God and opened the way for direct access to God. Over the centuries, the Papacy worked to undo all that Christ had accomplished and gradually made the world subject to Rome. The exterior organization of the Church came to take the place of the invisible Spirit-filled Church of Christ. A hierarchy developed conveying the Holy Spirit’s anointing from Christ to the Pope, archbishops, bishops, priests, and finally to “deserving” believers. External display and ceremony was substituted for Christian graces, the fruit that is a natural outcome of true faith and love toward God. Salvation was no longer a gift, but a reward for correctly following the prescribed course. Following the pattern of pagan Babylon, the Church established a spiritual nobility, separate and distinct from the common people. To accentuate this supposed difference, the clergy also adopted clothing borrowed from paganism that set them apart from the laity. The idea of a universal Christian priesthood was gradually lost sight of. The necessity of each member being connected to Christ as the vine to the branch, was replaced with the necessity of each member being connected to the Church and its Pope. In this way, the Roman Church usurped the priesthood from all believers. As the common people lost hold of Christ and turned to the increasingly corrupt shepherd for guidance, the Church slipped into a long period of spiritual darkness marked by widespread ignorance of the Scriptures, vice and corruption. At first, Rome’s bishop had been one among many equal brethren. But due to his privileged location near the emperor in the great city of Rome, the Roman bishop came to occupy the role of big brother. Over time, his brotherly counsel soon grew to be absolute commands. As the old pagan Roman Empire lost its grip on the ancient world, the bishop of Rome incorporated the ruins of the empire and its pagan religions into the organization of the Church and thus gained power. He seized from the empire fragments from its glorious past that would bring power and glory to himself. His title, Pontifex Maximus, along with religious rites and festivals, vestments and symbols were all gathered up by the bishop of Rome. “Keys of Peter” depicted on a Catholic building. 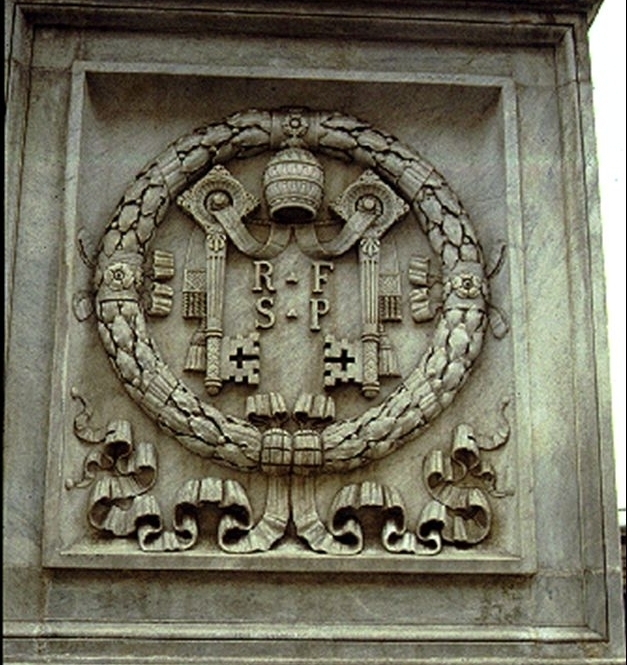 The Papacy claims to have the keys of Peter— the keys to heaven and hell. St. Alphonsus Liguori, in his The Dignities and Duties of the Priest (1927) tell us, “The priest has the power of the keys, or the power of delivering sinners from Hell, of making them worthy of Paradise, and of changing them from the slaves of Satan into the children of God. And God Himself is obliged to abide by the judgment of His priests, and either not to pardon or to pardon.” If this is true, then a system determines your eternal future, rather than God. 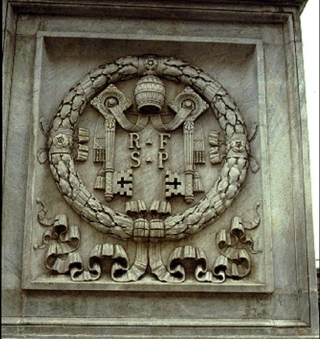 The primacy of Peter and the Papacy’s inherited keys are inventions of the Roman Catholic Church to support its claim of supremacy contrary to Jesus’ instruction. Political and economic upheaval set the stage for ambitious men to advance themselves as rulers over the Church. By many small steps afforded by many opportunities over time, the Papacy took control of the ancient Roman Empire, making it the Holy Roman Empire. Worldly-minded clerics often battled over the bishopric of Rome. St. Peter’s chair came to closely resemble the coveted temporal thrones of earthly kingdoms. History records that Popes often came to office through appointment by aristocrats and secular rulers, by bribery and by bloodshed. Frequently, those appointed as Pope were from aristocratic families themselves and served to extend the power of the ruling classes. At times more than one Pope claimed the right to St. Peter’s chair. 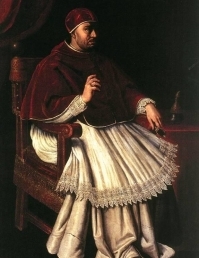 Through the dark ages especially, the Church hierarchy plunged into such an abyss of immorality that the years 904-963 are known by Church historians as the “pornocracy” or “rule of the harlots” because of the scandalous practices in Pope selection at that time. But the corruption did not end. 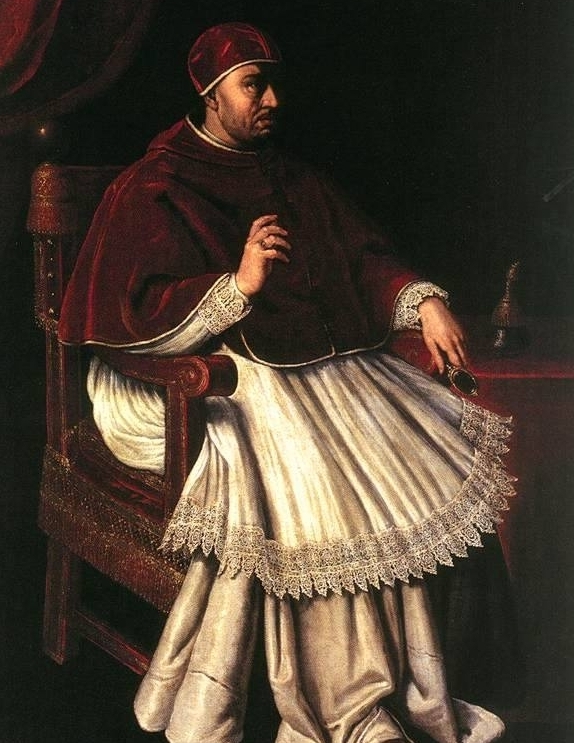 As an example of the corruption that prevailed, in 1033, the counts of Tuscany placed a 12 year old boy on the throne and named him Benedict IX. He grew up to be a homosexual and a murderer. A rival party put Sylvester III on St. Peter’s throne. Benedict IX finally sold the Papacy to a Roman Ecclesiastic. In 1046, there were three Popes. What outcome followed the Church’s abandonment of Christ and His holy word? Immorality is the sure result of disobedience to God’s requirements. The epitome of the Church’s fall from grace was the sale of indulgences which prompted Luther’s public challenge at Wittenberg. The doctrine of penance and the sale of indulgences was seen by some to be licence to sin granted by the Pope himself. The laity were not alone in their dissipation. Corruption of the clergy came to be taken for granted. Their unruly behavior forced civil authorities to draft laws to control them. Consequently, the people recognized in the leadership of the Church the same depth of depravity as they saw in the worst of sinners. Priests, bishops and Popes alike were the subject of jokes and ridicule. How then could corrupt shepherds show their flocks the way of salvation? Thoughtful people knew this to be an impossibility. The time had come for reform.